There are some things to consider when choosing the best shed plan, especially if this is your first DIY project. If you’re at the point of making the decision that you are going to attempt this on your own, the first thing you’re going to need is a good set of plans to work from. The internet has a myriad of designs available online; however, not all plans you come across are good. As a matter of fact, some are downright horrible, so when do you know you can trust the source they’re coming from? This is a valid question and one that deserves a valid answer with the three questions listed below that you can answer for yourself. 1. Does the Source Provide Free Plans? One of the best ways to see how trustworthy a source might be is to see if they offer free plans? It’s a very important quality because if they’re willing to show you something for free, it shows they care, and it’s not always about the money. These free plans can be simple to complex designs, and a visual testament as to what you will get in terms of drawing quality, technical specifications, and other important information. A good source of free shed plans can be found at Howtoplans.org website. 2. Are the Plans Easy to Understand? A good shed plan will have illustrations of the structure as well as step-by-step directions. It will be written in a way that the average person can understand. It will clearly list all of the materials needed, so you can plan a trip to the local home improvement store to get your materials. It will list the type and size of the structure as well as the gable style. The difficulty level should also be clearly marked, so you can make the right decision based on your level of carpentry skills. The easier the plan is to understand, the easier it will be to build. 3. Can You Learn More From a Design? A design that helps you build your first shed does a number of things. In the first place, it will boost your confidence for your next DIY project. Secondly, based on your results the first time around, you might choose an intermediate skill level or go “all-in” with an expert plan. Lastly, the information you learn from building a simple shed can be applied to more complex structures like an addition or garage; therefore, a design that teaches you these basic carpentry skills is a good shed plan. One of the first things to consider when deciding on what design to use is practical. The size of a shed will impact your wallet, so it’s important to figure out how much space you need now and in the future. A basic 8×10 shed can cost between $2,500 and $3,000 to build correctly; therefore, depending on your budget and storage requirements, choosing a design that adequately meets both of those requirements is the logical choice. Where Will Your New Shed be Placed? The location of where your shed will be placed can help you to choose a plan. If the shed is going to be built in the backyard or close to your house, matching the architectural style of your home is probably important to you. You want to select a design that offers that flexibility in order to make it look like part of the house. The good thing about using a shed plan is that it offers the freedom to mix and match to the exterior of your home. If you are building a shed in a location where appearance doesn’t matter and just need something for extra storage, you can choose a basic design with one door, and cover it with inexpensive construction materials to suit your need. Whether you want a nice exterior or basic look, a good plan will help you get it done. Before you select a plan, it’s important to know the type of foundation that it will be built on. There are a few foundation types that a shed can be built on like concrete, gravel, and wood framed sub-floor. The size of the shed will determine the type of foundation you should use. The bigger a shed is, the stronger the foundation should be. Pick a design that has a picture of the finished structure. This is a great tip for those who are unsure about different siding applications. Most plans do have a suggested siding application; however, if you’re a crafty person, you can install a variety of different siding applications to get the desired look you want. As your looking at the shed plan you want, it’s also a good idea to visualize how it should look once it’s finished. The roof for your shed is one of the most important components. Pick a design that uses roofing materials that are easy to install, like asphalt shingles, especially if this is your first DIY shed project. Other roofing materials like metal, rubber, cedar shakes, clay or stone tiles are nice, but they require a certain level of expertise to install correctly. Considering how important a roof is to a shed, it might be a good idea to spend a little more money on a quality roofing material. Instead of using tar paper under your asphalt shingles, you can give your shed an upgrade by using Grace Ice & Water Shield. You certainly don’t want to build a good shed that leaks. Choose a plan that has windows included because most sheds don’t have electricity and windows allow for extra lighting. Keep in mind, every extra window you install will result in more money and limit interior wall or shelf space. When it comes to windows, pick a shed that uses them wisely or you’ll end up a structure that offers more than storage space. Pick a design that has the type of door you need. Are you building a shed strictly for storage? In this case, a standard double door that comes with the plan will work just fine. If you need a larger door for machinery like riding lawn mowers, ATVs, snowmobiles, and motorcycles, you can adjust the plans to make the doors larger or you can install an overhead door to accommodate your equipment. 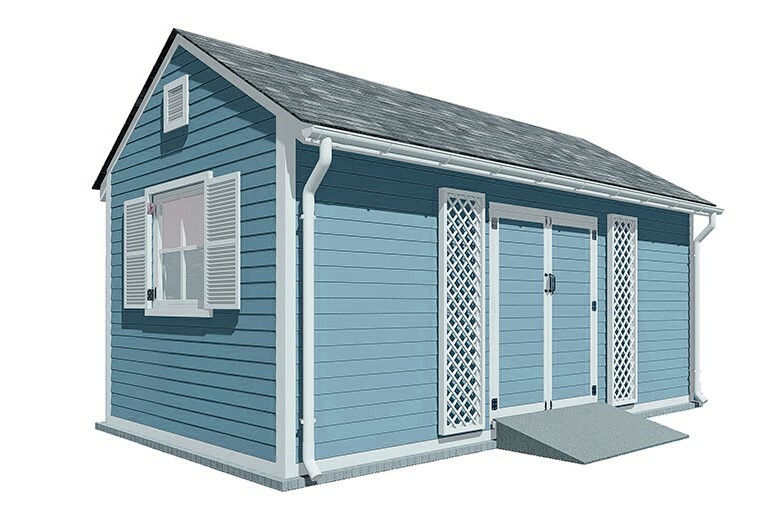 To preserve and protect your shed, pick a design that has vents in the gable ends. A shed is just like a house, it needs to breathe. Airflow is critical, especially for a shed that has no means of sustaining climate conditions. Without vents in a shed, it would be a sauna in the summertime, which is bad for the contents as well as being a breeding ground for mold and insects. In the winter time, condensation can take over on warmer days, and big ice spots can appear on your interior sheathing, which is bad because, eventually, those spots will rot. Now that you know how to choose a shed plan based on what you need and practicality, the next step is to see what the plan requires for materials, then go to your local home improvement store, bring the goodies home, get your plans out and start building. The above article was sponsored by Howtoplans.org. The information contained in this article may contain ads or advertorial opinions.